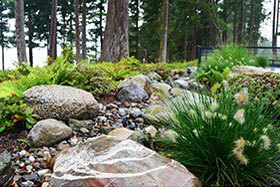 Heidi Skievaski is the owner of Sublime Garden Design, located in Snohomish, WA. 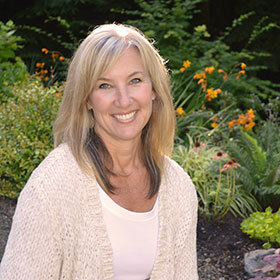 Heidi is a graduate of the Environmental Horticulture program at Lake Washington Technical College and a Certified Professional Horticulturist. 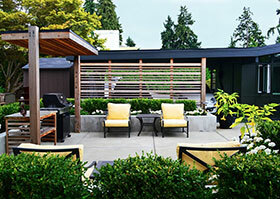 Sublime Garden Design serves primarily clients in Snohomish and King County. Inspired by her British Mother and Grandmother who are both avid gardeners, it was only natural that Heidi would eventually follow in their footsteps. Heidi remembers her mother giving her a small space as her own garden when she was a child. This spark was re-lit after leaving the corporate world in 2001 and taking up gardening as a hobby. It wasn’t long after that her ever-so-persistent-mother-in-law convinced her to design a garden for her waterfront property. Heidi begrudgingly agreed and it was in that process that she fell in love with the process of creating gardens for others. Her combined love of working with people and gardening soon turned into a passion for residential garden design. The experience prompted Heidi to enroll in the Environmental Horticulture program at Lake Washington Tech in 2005. In 2006 Heidi went to work for Nyce Gardens, where she worked with Jay and Tina Nyce (FAPLD) part time for two years while slowly adding to her own client base with Sublime Garden Design. 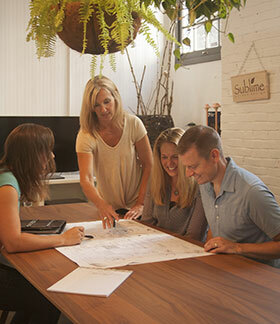 Heidi began working full time under Sublime Garden Design in 2008. Heidi was a one-woman-show until August of 2011 when she hired Landscape Architect, Kryssie Maybay. 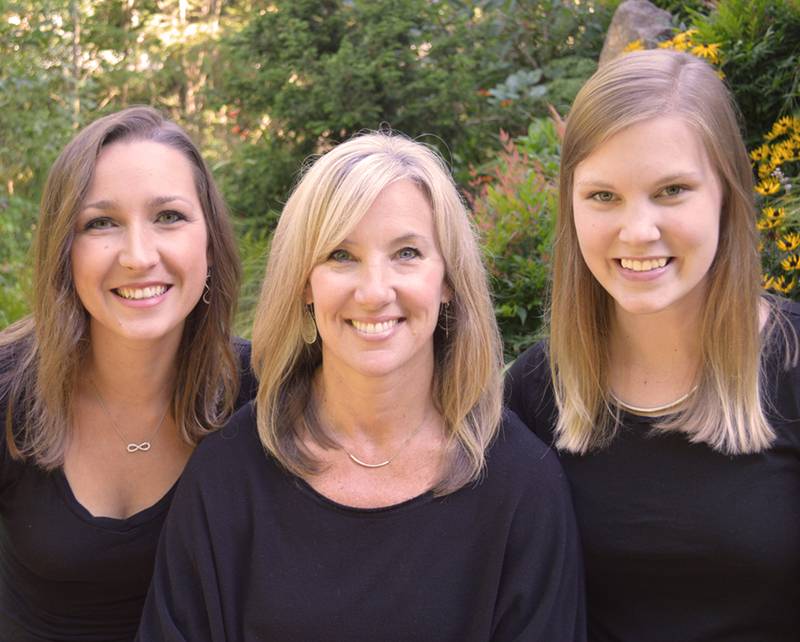 ”Hiring Kryssie was one of the best decisions I have ever made. It was scary at the time, becoming responsible for the livelihood of another person, but I knew that if I wanted to do more complex work I had to either get more schooling or hire someone who had knowledge in the areas that I didn’t.” The most recent member of the Sublime team is Deanna Knoff. Deanna has a background in Architecture and has a well-rounded set of skills including AutoCAD, Sketch Up, and WordPress. This project was part of a complete home and landscape remodel that began in 2012. The landscape, like the home, was outdated and overgrown. 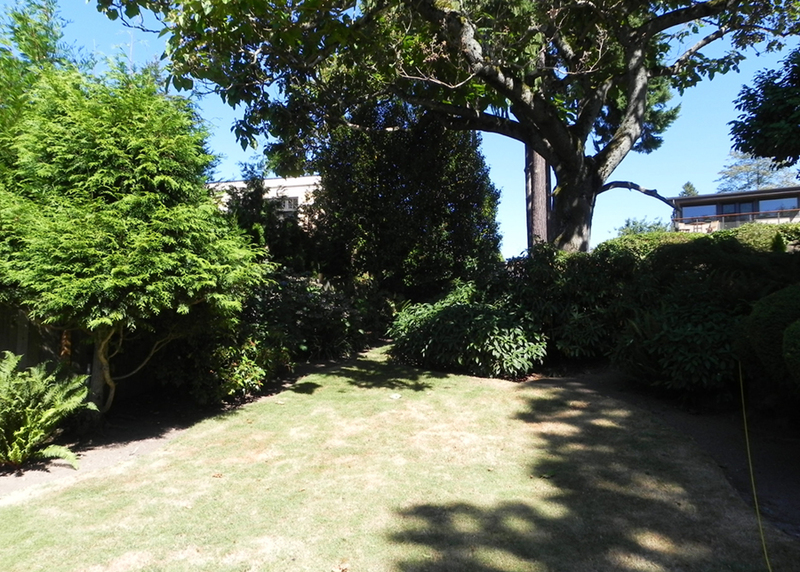 The existing landscape lacked interest, consisting mostly of junipers, rhododendrons, and a large oak tree that was too close to the house, interfering with the sewer lines, and blocking the clients’ view. The homeowners wanted the landscape to compliment the mid-century architecture of the home yet still have warmth, charm, and character. 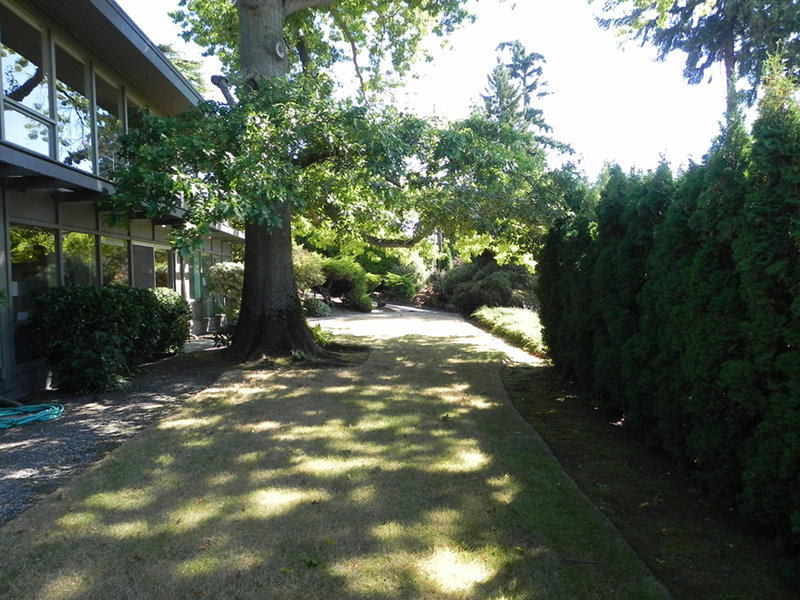 The center piece of the garden was the enormous Empress tree. There were many discussions around removing the tree but in the end the homeowners just could not let it go. 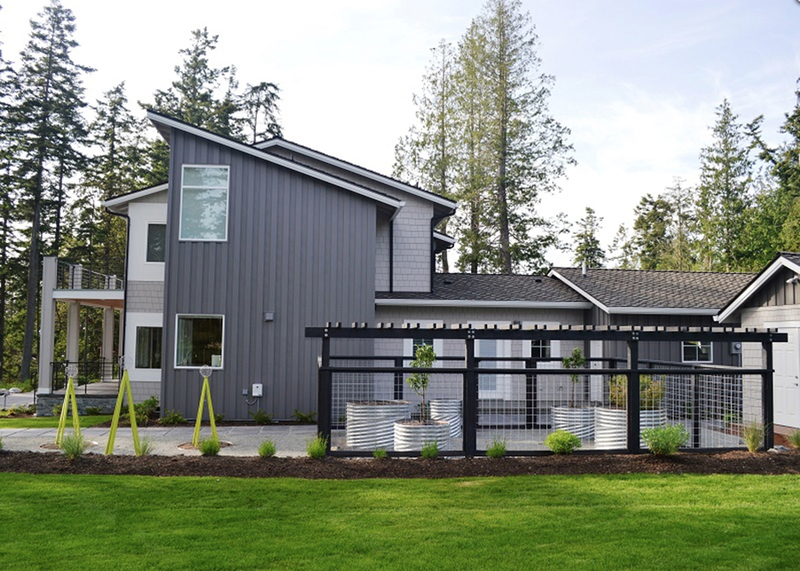 Other design challenges were the existing large basalt retaining wall that we needed to work with and a keystone retaining wall and row of arborvitaes that were on the neighbor’s property. The clients wanted a place to relax and dine with friends, to be able to grill undercover, and grow cut flowers and vegetables. Two small dogs also share the home so they needed grass to play on and do their business. 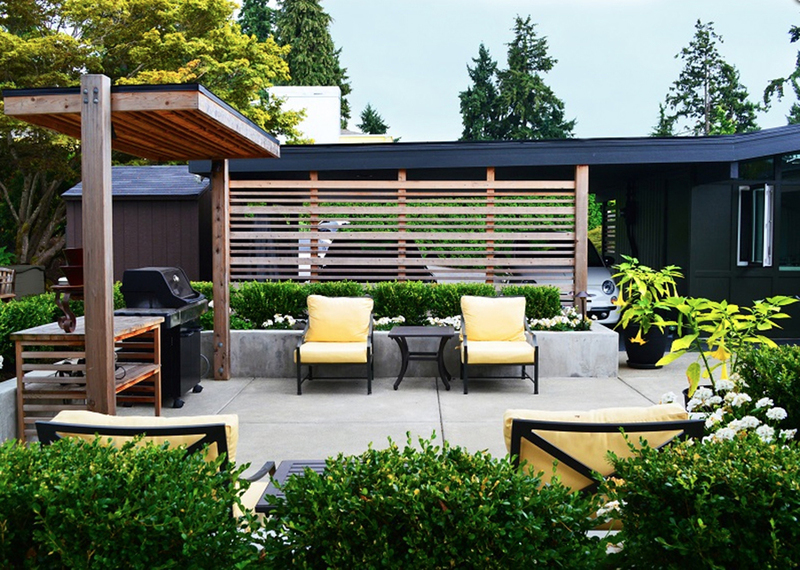 The patio is a simple space with boxwood-filled raised concrete planters and a covered grill space with a built in table. 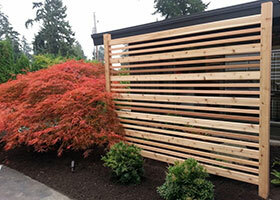 A wood screening panel hides the view into the carport. 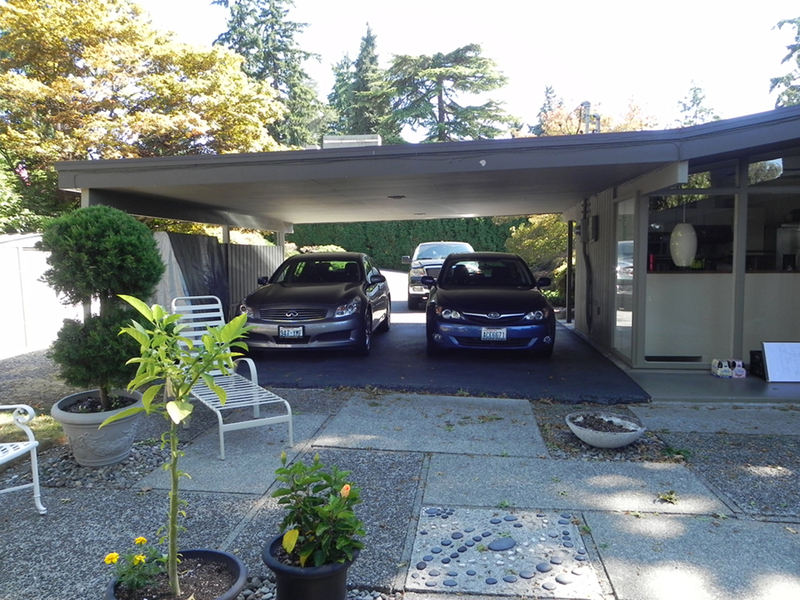 The same detail is repeated in front of the entry area window to add privacy and screening from the neighbors. 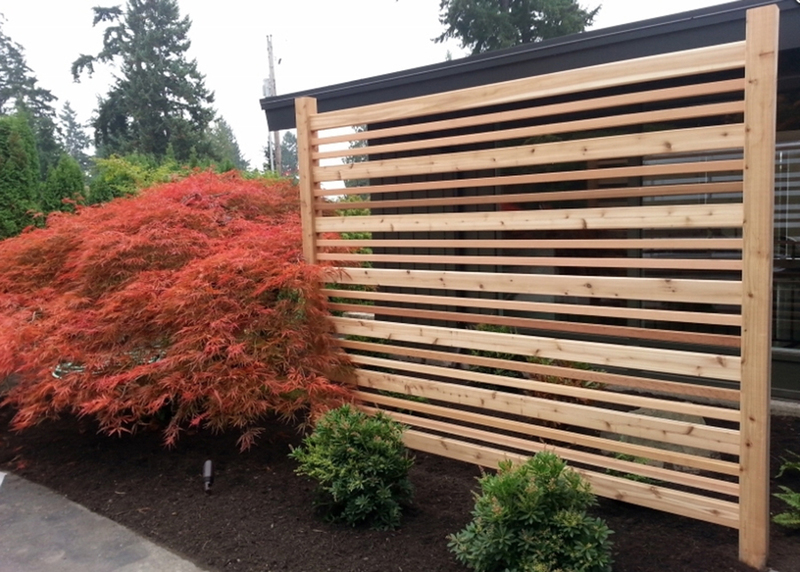 The clients wanted a fairly simple, low-maintenance plant pallet with only white flowers. 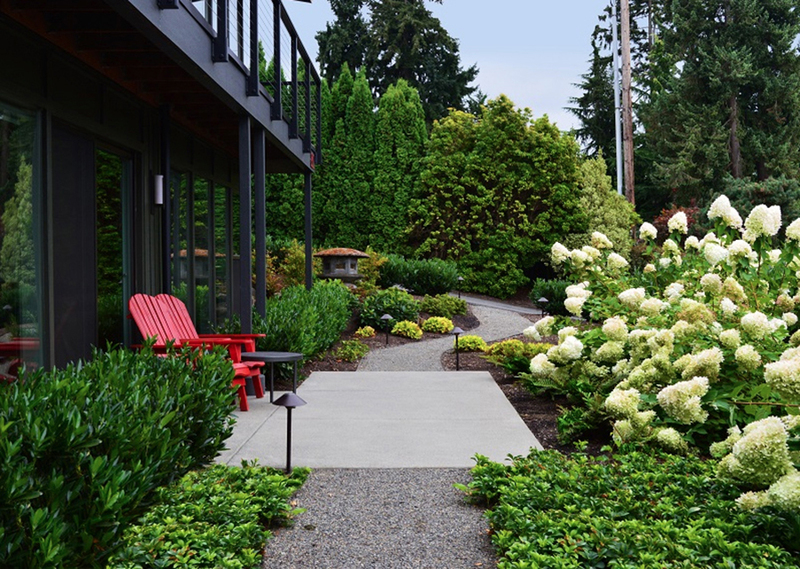 Mass plantings of Limelight hydrangeas now line the walkway adding interest and also provide screening of the neighbor’s arborvitae hedge and retaining wall. Hellebores, white astilbe and ferns surround the Empress tree and an all-white cutting garden consisting of phlox, lilies, Japanese anemone, and echinacea provide the clients with a variety of flowers to create a cheery centerpiece at a moment’s notice. 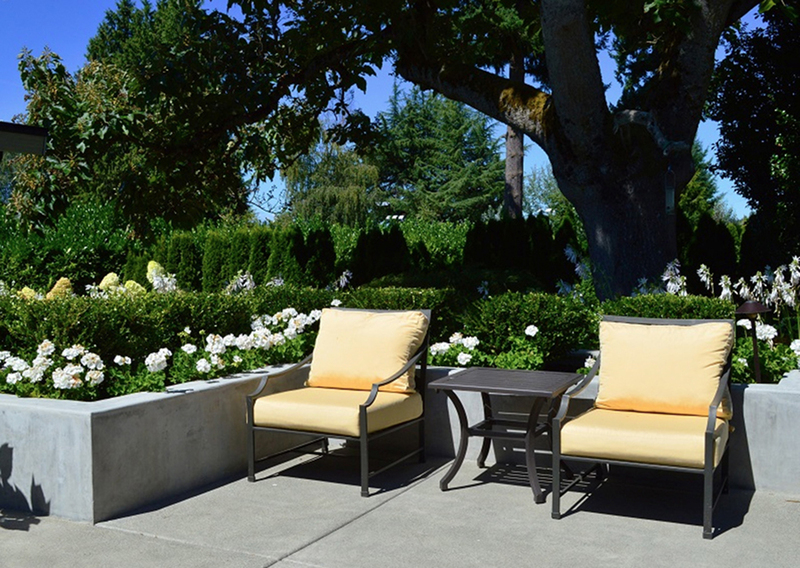 The client finished off the space by adding accents of yellow with cushions and potted Brugmansias that add personality and liven up the patio space. 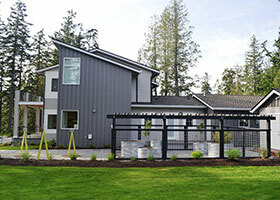 This home was new construction and the property was nothing but bare soil when we first met with the homeowners. 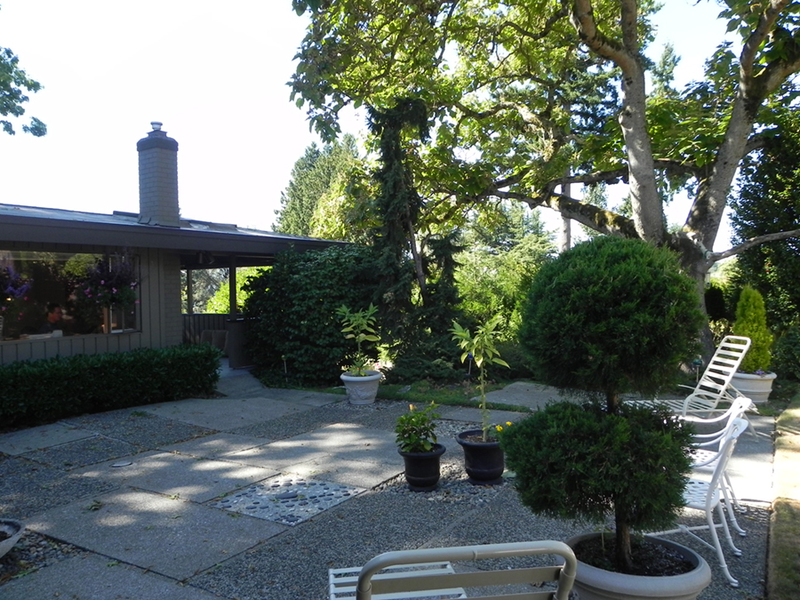 The high-bank waterfront property on Camano Island and has one of the most amazing views we have ever seen. The clients wanted a contemporary and naturalistic space that was simple yet stunning, to relax, entertain family and friends, and to enhance and enjoy the views. The only existing feature on the site was a curtain drain that encircled the majority of the property. It was unsightly to say the least. Fortunately there was also a large pile of boulders that had been excavated in the building process that were ours to use as we saw fit. 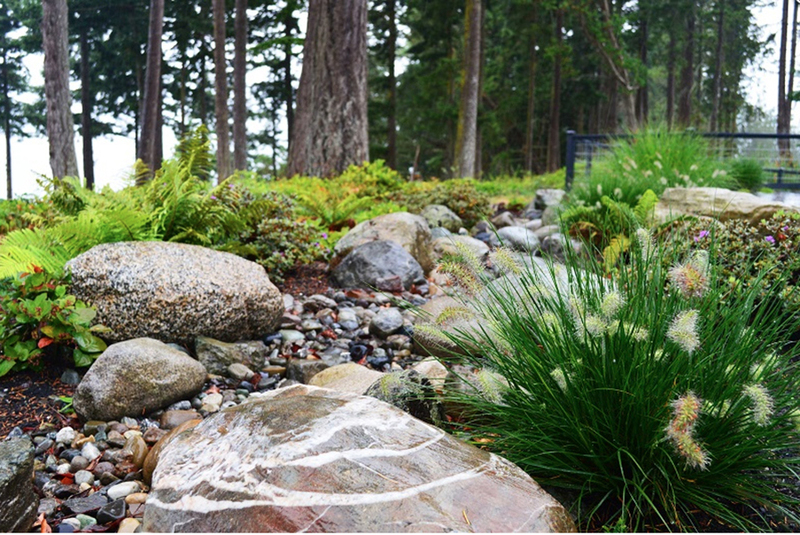 We used them, along with several more large boulders and various sizes of cobble, to re-create the curtain drain into a naturalistic dry-stream bed. Grasses and ferns were planted to soften the edges, give it a natural feel, and create a transition to the natives already on the bluff of the property. 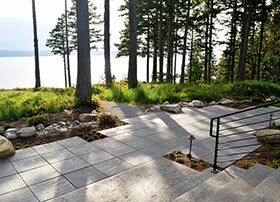 Architectural 2’x 2’ pavers were used to create a patio for enjoying the waterfront view and to connect the spaces. 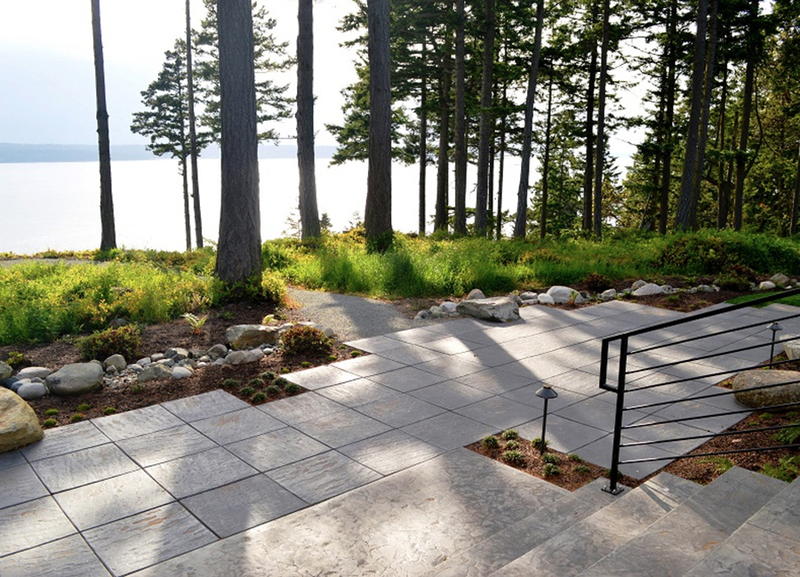 The patio has an irregular edge cut around protruding boulders, which act as additional seating and integrates the more contemporary look of the patio with the naturalistic look of the dry stream bed. Dwarf mondo grass and Scleranthus fill in the gaps. Like the Medina project, the clients wanted a low-maintenance, simple plant pallet but with interesting textures and forms. 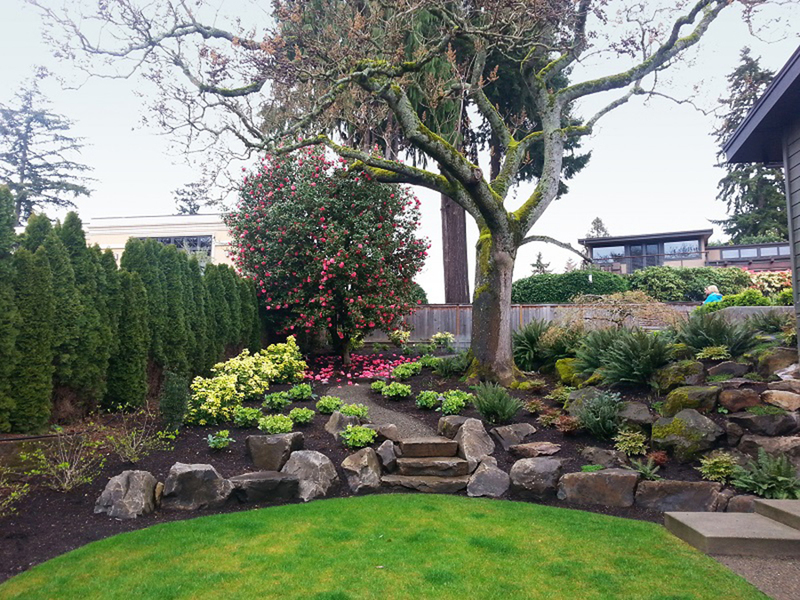 A variety of both evergreen and deciduous plants including luecothoe, hellebores, ferns, nandina, pieris, Japanese maples and viburnum were used in the perimeter planting beds to blend with the native landscape. 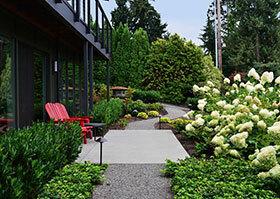 Closer to the house Cephalotaxus ‘Duke’s Garden’ and Little Lime hydrangeas lend a more contemporary feel. 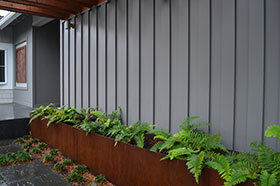 Three large paperbark maples, echo the color of the fern-filled Corten planter and the laser cut ‘Birch’ panel by Gina Nash that add interest to the entry. 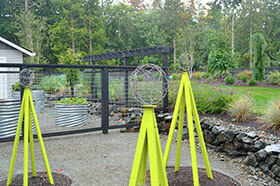 Five galvanized steel culverts make up the edible garden. Galvanized welded wire fencing keeps the deer out and the Akoris Tuteurs by TerraTrellis add a contemporary feel, a splash of color, a place to grow peas, beans and other vines. A lavender hedge planting next to the edible garden attracts pollinators and provides color and fragrance. Contact us today at contactus@apldwa.org for more info.